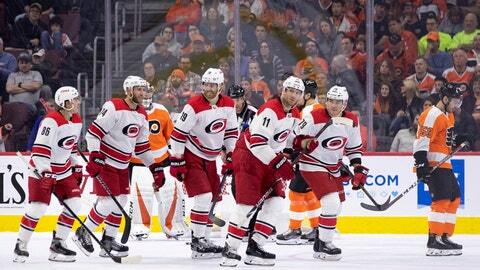 NOTES: Carolina beat Philadelphia for the fourth time this season. It’s the first time the Flyers failed to earn a point in a season series vs. the Hurricanes. … Brind’Amour recorded the most wins (46) and points (99) by any Hurricanes or Hartford Whalers coach in their first season behind the bench. … Philadelphia finished the season as the league’s top faceoff team. The Flyers entered Saturday winning nearly 55% of their faceoffs.